Once again another month has passed. 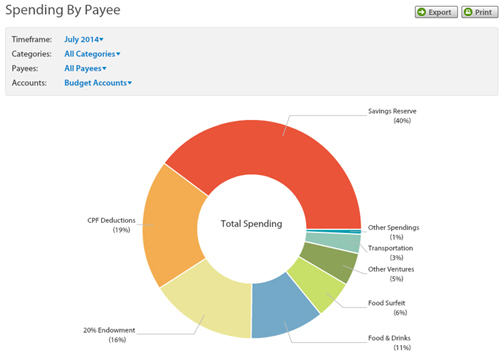 With YNAB, I have successfully taken down all my daily expenses, big or small, with minimal hassle. The feeling of the end result, aka the chart report, is just alluring and assuring since I know that my spendings are well taken care of (or not)! Lastly, the main take away for this month is the question – If a depreciating purchase of an asset, which gives intangible dividends, worth it in the long run? During this month, I had purchased two sets of considerably compelling purchases (>$50 each) which as of writing, I am still unsure if it is worth the cost. I am sure some of my readers will face this sooner or later during their budgeting months. Hence with noting the breakdown of the purchases, I hope you will be able to understand how a purchase should be analysed before making a BUY decision. Also, to get an answer for myself if they are worth it at the end of this post! Reason: Having purchased some adjustable weight dumbbells and a Double-end bag for going a year now, I believe every fitness purchase I made has been an effective investment. The dividends include getting compliments, self-respect and confidence which are mostly intangible. Working out 1-2 times a week with weights and training tactical drills 1-2 times a week with my DEB, I would still take this fitness pathway to my current build if I were to go back in time. Therefore, after extensive research and budgeting, I have decided to get an acceptable quality workout bench as inexpensive as possible. While the key specifications I require are its ability and stability to work as a benchpress and tricep overhead pulls which I am working them by lying awkwardly on the floor previously, I am not getting it mainly for doing sit-ups. Looking around Qoo10 shopping site, I found a sit-up bench on sale. Reading the multiple reviews about seller’s excellent customer service, delivery time and most importantly the solid build of the sit-up bench, I fell for the promotion pricing and got it delivery in two days. Reason: In need of a slim-cut jeans for more than a year now, bought two pairs of non-branded skinny jeans within past year but got ruined due to extreme shrinkage after throwing into dryer. Was waiting for Levis to come out with some promotion as I do not have a reason to buy a jeans which is over $100. Having worn five times now, I believe this is my best pair of jeans for past whole decade (Not promoting Levis nor exaggerating my post, it is really just that I can never find something that fits me without having it tailored)! Purchase price: $120. Saved up to SGD$50 due to Hari Raya Puasa Promotion “40% off bottoms + 30% off tops” by buying the additional t-shirt. Not sure if these breakdown (similar to a financial diary of some sort) interests you guys but it really does help me in making decisions, giving reasons why and why not to buy a big purchase. I genuinely hate regretting a big purchase, don’t you too?